The leading Electric heating elements manufacturers, Chhaperia continues its exponential growth in designing and bringing up new and optimized products every time. With an aim to produce top-notch quality products, our services have made a way into national as well as international markets. 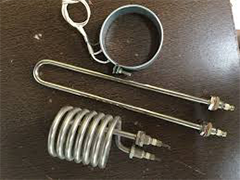 Since 1994, the motive spirit within the industry has driven us to be the leading electric heating elements manufacturers. In spite of challenges, we invest less time in reworking and redesigning. This keeps us to be on the track of excellence. Our rise in reputation is because of the quality of our products. On-time delivery is what we prefer. There’s no point of rejection. After the product is manufactured, the element is subjected to tests. Re-work is a hectic process, and we spend less time on it. Continuous optimization of the QMS process/system is another practice at Chhaperia. Being electric heating elements manufacturers, our services continue to serve the world, never resulting in a single percent drop in quality. Explore all the electro heating elements under one roof.